A surface in a warm, light cream shade for a sophisticated look that is compact yet rich in lavish details. 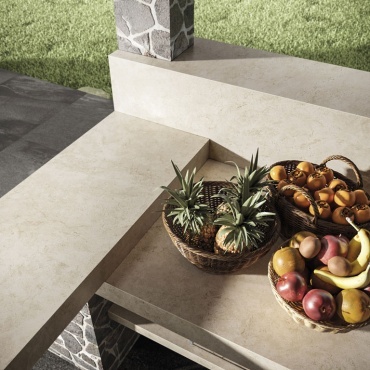 With its delicate veining, Cream Prestige by Atlas Plan is ideal for any style of indoor and outdoor space: from the most rustic or classic to more modern and refined settings. Large-size marble-effect slabs in porcelain stoneware. Porcelain slabs in size 162x324 cm available in 12 mm thickness with a silk finish. Suitable for covering tables, kitchen islands, worktops, backsplashes, bathroom vanity units, countertops, bar and restaurant counters. Cream Prestige Habitat: for the outdoor kitchen composition, Cream Prestige silk by Atlas Plan is combined with Klif Dark by Atlas Concorde and country kitchen-style accessories. A delicate mood with the domestic space flowing seamlessly into the outdoors.